I must declare my interest. Michael Molkentin and I share a publisher and in August 2008 Ian Bowring told me he was publishing an account of the Australian Flying Corps. I have done a bit of reading in my time about Australia’s growing civil aviation industry, the interwar RAAF and Australians in the Second World War. I was keen to discover more about their flying antecedents as well as the early flying days of those who had significant places in my Second World War research. So, when Ian mentioned Fire in the Sky, I was excited. Often, the anticipation is better than the event, but not in this case. Fire in the Sky surpassed my expectations. Fire in the Sky is roughly divided into two sections: the Half Flight and 1 Squadron’s experiences in Mesopotamia, Egypt–Sinai and Palestine, and 2, 3 and 4 squadrons on the Western Front. In some respects it reads like a typical squadron history (despite the multi-squadron focus) and I will admit I find dry, operations-based accounts boring but when I flipped through to the bibliography, which includes Molkentin’s thesis ‘Culture, Class and Experience in the Australian Flying Corps’, I knew there would be a firm emphasis of the men of the flying corps, and not just their operations. And I was not disappointed. 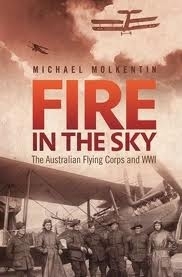 Rather than presenting a straight blow-by-blow, battle-by-battle history, Molkentin has skilfully woven personal experiences of airmen and ground crew into a readable and absorbing account of Australian Flying Corps operations, giving it a sound social history grounding. Molkentin has drawn widely on public and private, published and unpublished sources. One of the standout stories is that of Owen Lewis. The reader first meets Lewis, a freshly minted observer, when 3 Squadron posted him to a British unit for training with an experienced pilot. It was a hectic time and Lewis and his pilot experienced enemy fire in five aerial combats; their aircraft was badly damaged during two of them. Within ten weeks, Lewis was among 3 Squadron’s veteran observers and about to embark on a fortnight’s leave. But Lewis did not make it to England. Drawing on Lewis’ brief diary, which abruptly ends the night before he was killed; his brother Athol’s diary; an interview in The 14–18 Journal; and the published memoir of his younger brother, Brian, Molkentin movingly recreates from a number of perspectives Owen Lewis’ last day and the aftermath of his death. This is storytelling and social history at its best. But it is not a one off. Molkentin tells of Frank McNamara and his VC-winning rescue of Douglas Rutherford as well as the what-happens-next for both men (and especially Rutherford who was perceived as having the ‘unlucky habit of attracting trouble’), and unravels the mystery surrounding the death of Manfred von Richthofen. The Richthofen story is another standout story among many. Molkentin discusses the various who-got-the-Baron stories and draws his own conclusions regarding who did what. Even so, he indicates that readers and historians (as one admits) may sentimentally cling to long-held favoured explanations. I am particularly interested in the notions of chivalry and the ‘knights of the air’ and how these concepts originated. Molkentin has unearthed some outstanding examples which left me wondering if both German and Australian pilots realised they were actually at war and not involved in some gentlemanly game. But sadly, the Richthofen episode shows all too clearly that chivalry was something practised by only a handful; there was little dignity or honour in the plundering of Richthofen’s body and possessions. And there was certainly nothing chivalrous in the actions of some of the scout pilots who, after the Armistice was declared, returned from a purported search for a missing squadron member with conspicuously empty bomb racks. Molkentin relates the early flying careers of significant interwar and Second World War personalities such as Richard Williams, Harry Cobby, George Jones, Lawrence Wackett and Hudson Fysh, and also tells of those whose early promise, such as that of George Merz, was not realised. He recounts what I term ‘vagaries-of-war’ stories such as that of two of ‘Jasta Boelcke’s’ victims in the dying moments of the war. Arthur Palliser was one of 4 Squadron’s most experienced pilots and had survived four years of war, only to be killed in battle on 4 November 1918, one week before the Armistice. Palliser was due to return to Australia the next day and had told George Jones that ‘If I was only lucky enough to break my finger in the hangar door I would not be able to fly today’. On the same day, 23-year-old Charles Rhodes was shot down on his first patrol. Molkentin points out that he would not have even had time to learn the names of his fellow pilots. Molkentin notes that just 880 officers and 2840 men served with the AFC during the war and, of those, only 410 pilots and 153 observers fought in battle. These 563 men were significantly fewer than those who enlisted in the AIF. So few that Les Carlyon did not even mention the AFC in the 700+ pages of his The Great War. And yet its contribution was significant. Its service spanned three continents and nearly every type of aerial operation during the Great War. As Molkentin points out ‘Australian airmen and mechanics were contributors to the pioneering days of aerial warfare in Mesopotamia and Egypt, when aeroplanes were still widely perceived as a reconnaissance arm only. They were there too in 1918, keen participants in the evolution of air power as a tool for gaining air superiority, bombing strategic targets and directly supporting ground operations.’ And of course, they regularly increased the victory tally, producing ‘aces’ and accounting for some of the earliest DFCs of the war. Given the importance of its role, I wonder why the AFC has remained largely unsung since the 1923 publication (and subsequent reprints) of Cutlack’s The Australian Flying Corps in the Western and Eastern Theatres of War 1914–1918, the occasional memoir, the odd chapter in air force histories and the all too rare private diary. The publishers and contributors of Cross & Cockade and The 14–18 Journal have done much to ensure that the AFC heritage is not lost but individual journals, as well as the unpublished manuscripts held in public institutions, are normally lost to or out of bounds of the general reader. Thankfully, Molkentin has vividly brought these stories and memories to a new generation and now re-establishes the significance of AFC involvement in the Great War. He notes parenthetically that, at 27, he is too old to be an AFC scout pilot. Readers should be pleased that he still has many writing years ahead of him, whether he turns his hand again to aviation history (and I for one certainly hope he does) or other aspects of Australian military history.